Are you pregnant and needing options for adoption? Are you considering providing foster care or adopting a child, teen or siblings? Are you willing to give of yourself for someone waiting to join a loving family? There are many children in Michigan from newborn to age 18 who need a caring, supportive, and long term family situation or to be adopted into a loving family. St. Joseph answered this call and we invite you to consider becoming a foster or adoptive parent. Train the young in the way they should go; even when old, they will not swerve from it. 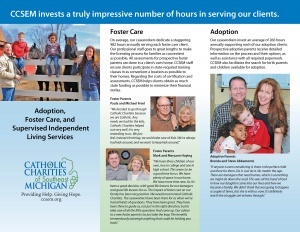 At Catholic Charities of Southeast Michigan (CCSEM), we provide help and hope to children awaiting the welcome and support of a foster or adoptive family. We also offer extensive services to those providing foster care or going through adoption. In 2013, CCSEM provided foster care or adoption to more than 400 children from infants to 17 years of age. Many more await our help. Together, we can make a difference. Every day, children need safety, stability, routine and an abundance of love. With foster care and adoption, many government agencies are involved and CCSEM is here to assist those caring families who open both their heart and home to children in need. In the case of adoption, both the biological and adoptive parents need support throughout the process. We answer the call. Many government agencies are involved in foster care and adoption. CCSEM assists those who want to open their hearts and homes to children in need. In adoptions, the biological and adoptive parents need support throughout the process. We answer the call. CCSEM counselors and their teams coordinate with social work staff at area hospitals and other institutions to assist families in filing legal documents, facilitating communication between birth families and adoptive families, and in providing post-adoption counseling. Additionally, CCSEM identifies stable, nurturing foster homes for children and teens and provides resources, training, and support to foster families. While the goal in foster care is to reunite children with their birth families when possible, many foster families transition to adoption. According to the Michigan Adoption Resource Exchange, 93 percent of children in Michigan’s foster care system are adopted by the child’s foster family or a relative (someone with whom the child has an established relationship). Would you like to provide a child love and stability during a time of uncertainty? Temporarily welcoming a child into your home is a generous gift. We strive to ensure children experience as few foster care placements as possible since every move is difficult and presents its own set of challenges to a child. The goal in foster care is to return the child to their biological home or family circle, and therefore, the role of a foster parent is vital to the wellbeing of children in need. There are many children who age out of foster care and CCSEM is there to help them bridge to adulthood through our Supervised Independent Living and Independent Living programs. These initiatives match families with teens and young adults no longer in foster care so near-adults or young adults can learn essential life skills in a supervised and supportive environment. The family provides a home, assists in transportation and other living support- helping the youth or young adult to grow skills in independent living. This compassionate service assists teens to maintain jobs, attend college and build fundamental life skills, bridging to self-sufficient living. Through this program, many participants graduate from high school and enroll in college. Life is a miracle and pregnancy can be a very emotional time, especially in situations of adoption for – the biological and adoptive families. CCSEM provides counseling for – pregnant mothers, helping them through all stages of pregnancy. Our services also assist families wishing to adopt with the administrative procedures of adoptions such as home and profile studies, questions and obstacles that arise, and through each step of the process. To learn more, contact us today. The sooner you connect with one of our caring counselors, the sooner you can begin to change the life of a child in need – and yours!